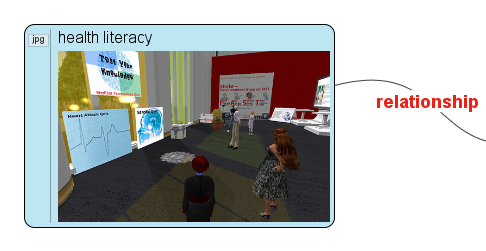 VUE or Visual Understanding Environment is a free downloadable tool from Tufts University. It’s mindmapping and content mapping with a decidedly data-oriented bent. Am overview of VUE is provided in the video below. To create a basic node structure is pretty intuitive. In one method, you just drag and drop from the shape palette. 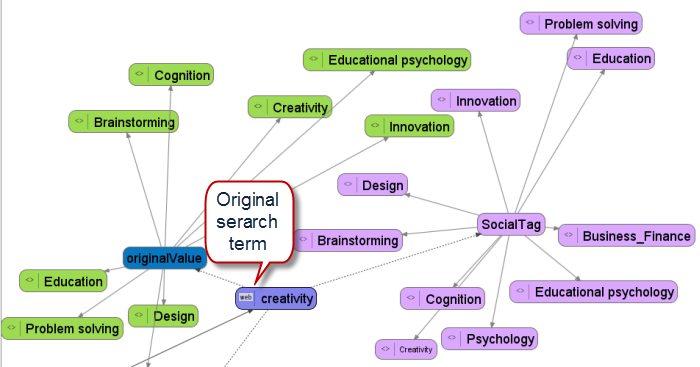 A pretty basic mindmapping feature, right? However, VUE does allow you to add a label to the connections between nodes, which isn’t something you find in all mindmapping tools. The basics of node creation are shown in this video. 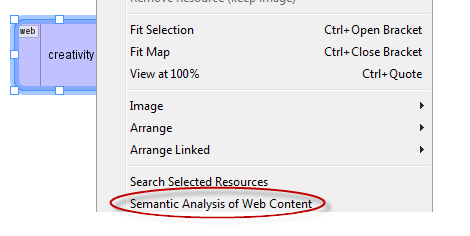 You can add urls and image content to your nodes, admittedly pretty standard in most mindmapping programs. However, you can also select a node, right click on it, and ask VUE to select the most relevant image from Flickr (only a Creative Commons image will be selected). 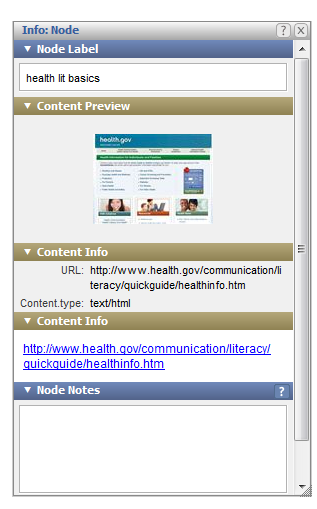 The info panel will let you view more detailed information about content associated with a node and you can add your own notes and keywords to add additional context. 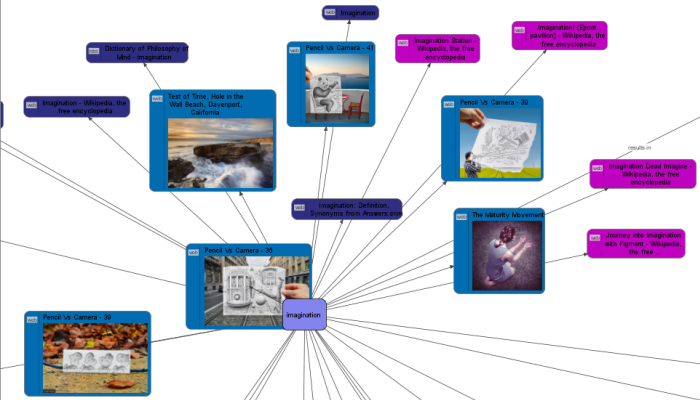 If this were all there was to VUE, I’d recommend that you stop here and find one of the other mindmapping tools out there (e.g., Popplet, Mindomo, or SpicyNodes), because they’re cloud-based, a lot more intuitive, and as visually appealing. The VUE engine will automatically find and create related node terms. The website that formed the core of the search (linked to “creativity”) is here. As you’ll notice, there are nodes containing duplicate words and some you might not consider relevant. However, it’s easy to marquis select one or more nodes at a time to delete them if they’re not relevant. 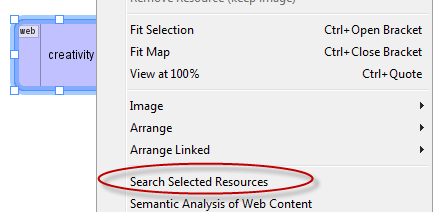 You can also search selected resources and when you use this option your node doesn’t necessarily have to be associated with a url. 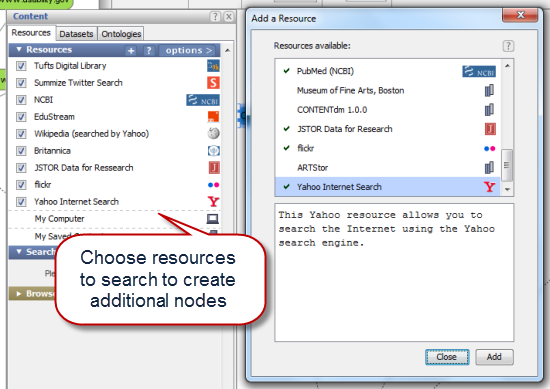 This option allows you to search Yahoo, Twitter, Flickr, NCBI, and the Tufts Digital Library, among many other sources, once you add these to your resource library. Doing so automatically populates your node map with hyperlinked nodes and images (if you’ve added image collections to your resources). An overview of these processes is shown here. If the data collections in the resource library aren’t enough for you, you can also tap into additional data collections including RSS feeds. Finally, you can also create presentations based on selected paths through nodes as demonstrated in this video. You can find out more about VUE by accessing the User Guide, but your best bet for understanding VUE is to download the tool and play with it. As noted, there are easier ways to perform mindmapping and concept mapping, but the power of VUE rests in its extremely rapid search and collection of diverse data sources and its display of these sources in the form of a node map. Seeing relationships and concepts you may never have thought of as you identify and connect concepts you do understand is an important way to get a broader view of a knowledge domain. There is a learning curve associated with VUE, but it’s a tool worth exploring. This entry was posted in content mapping, elearning tools, instructional design approaches, VUE and tagged concept map, concept mapping, content map, content mapping, data mining, EDM, educational data mining, Flicker, LAK, LAK11, learning analytics, mindmap, mindmapping, semantic web, Tufts Digitcal library, visual understanding environment, VUE, web 2.0, Web 3.0. Bookmark the permalink.